The U.S. Food and Drug Administration (FDA) has granted Breakthrough Therapy designation to rapastinel, which follows the medication receiving a 2014 Fast Track Designation from the FDA. Rapastinel, an investigational medication for adjunctive treatment of major depressive disorder, is an intravenous drug that is a novel NMDA receptor agonist. It is being developed by Allergan. The Breakthrough Therapy designation is a new category for agents that treat serious medical conditions that have the potential to be a “substantial improvement” over existing medications. It is intended to fast-track development of these agents. Ketamine is the NMDA receptor agonist that has made the topic of agents like rapastinel so exciting as potential treatments for a major depressive disorder. But ketamine comes with a number of side effects. 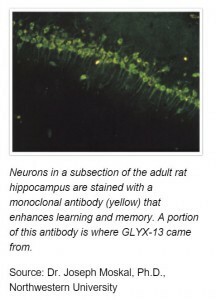 The origin of rapastinel (formerly known as GLYX-13) is illustrated in the picture to the right and in a press release from the NIMH, which funded some of the research on this compound, from two years ago. The results from the recent Phase 2 clinical trial showed that a single administration of GLYX-13 produced statistically significant reductions in depression scores in patients who had failed treatment with current antidepressants. The reductions were present within 24 hours and lasted for an average of 7 days. The effect of a single dose of GLYX-13 was nearly twice as great as the effect seen in clinical trials of most conventional antidepressants after 4–6 weeks of treatment. The researchers reported that no psychotomimetic or hallucinogenic side effects were observed. Allergan plans to start phase 3 studies of rapastinel in 2016. Investigational Drug for Depression Receives Breakthrough Therapy Designation From FDA. Psych Congress. February 2016. Ketamine Cousin Rapidly Lifts Depression Without Side Effects – Science Update. NIMH Science News. May 23, 2013. Burgdorf J, Zhang X-l, Nicholson KL, Balster RL, Leander JD, Stanton PK, Gross AL, Kroes RA, Moskal JR. GLYX-13, a NMDA Receptor Glycine-Site Functional Partial Agonist, Induces Antidepressant-Like Effects Without Ketamine-Like Side Effects. Neuropsychopharmacology , April 2013. 38:729–742.